Unconditioned Spirit is the textbook from Course One of the Unconditioned Spirit Home Study Course. To know all about spirituality is a good first step. To embody it is the journey. The Unconditioned Home Study Course takes you deeply into the sublime knowledge taught by Maharshi/Michael Mamas (Michaelji). It is an exploration into the final and greatest frontier – that which dwells within you. As you progress through this book and accompanying CDs and DVD, you will move more deeply into the experience of Unconditioned Spirit. Throughout your life, this course will prove to be a cherished companion, as practical as it is profound. The Unconditioned Spirit book is the textbook from the Unconditioned Spirit Home Study Course. 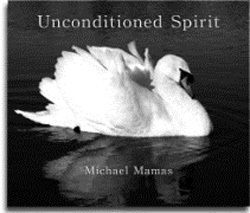 In this book, Michael Mamas expands the notion of spirituality, revealing stunning insights into the nature of life and existence. A fascinating book, rich in wisdom and insight.